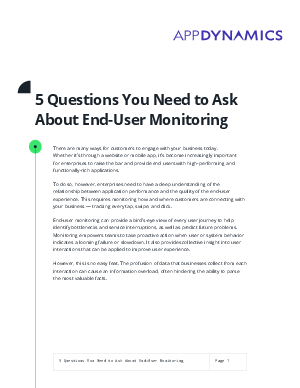 This Whitepaper will examine the following five questions and whether they serve as springboards to implementing effective end-user monitoring, hopefully helping to cut through the complexity that so often plagues this process. There are many ways for customers to engage with your business today. Whether it’s through a website or mobile app, it’s become increasingly important for enterprises to raise the bar and provide end users with high-performing and functionally-rich applications. To do so, however, enterprises need to have a deep understanding of the relationship between application performance and the quality of the end-user experience. This requires monitoring how and where customers are connecting with your business — tracking every tap, swipe, and click.